Status: offline So I have a wonderful collection of Italian bombers and German night fighters but no apparent means of giving them to anyone since there are no Italian level bombing squadrons and (so far - 3/43) no German night fighter squadrons. Are these planes just there to torment me or is there some way to allocate them to a squadron or change its type? A number of German NF squadrons arrive in Aug 1943. No idea on the Italians. Status: offline So what you are alluding to is that Night Fighters will convert to something more useful? Status: online I suppose it is worth separating the conversion of the actual aircraft (which is the table above) from the swapping of airgroups to other aircraft. Aircraft conversions have a number of blind alleys - for example Bf109G2 in the German national pool will get converted to Bf109G2(S) in the Slovakian national pool. They will never be used as this happens after the Slovak air force loses the last of its airgroups - so they will sit there till the end of the game to torment you. There are only a small number of night fighters produced, not enough to fill a full airgroup for a long time. And the Germans do eventually get night fighter groups arriving. The Italians have a lot of aircraft you will never be able to use by manual swaps - not just night fighters, but level bombers etc. While airgroups can convert to have aircraft of a different type (for example fighter bomber groups can change to fighter groups) as far as I know so far no non-night fighter airgroup can change to a night-fighter airgroup. But I am still researching this in scenarios. Status: offline Perhaps if you let them at night missins only they will eventually change to a night fighter type? Status: offline Thanks for the help everyone. 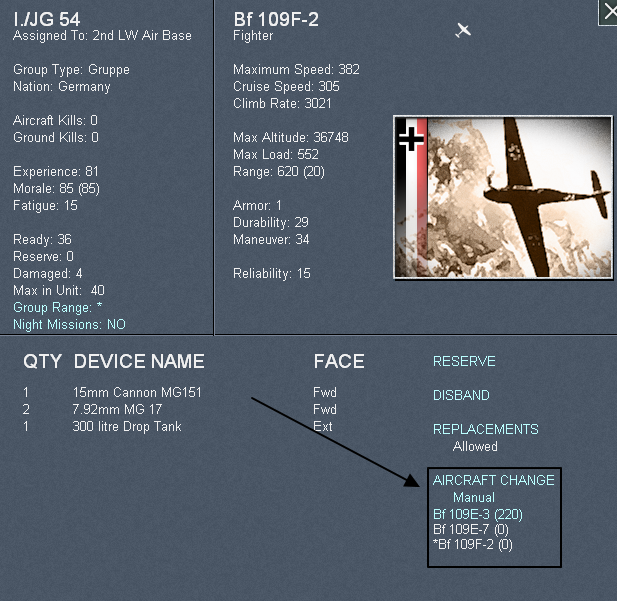 I have now mastered the art of manually upgrading the planes and the night fighter squadrons have arrived. The Italian level bombers never got the opportunity to be used as the Italians never got any level bomber squadrons. I wonder, if anyone has noticed, whether the automatic upgrade option lets the AI "illegally" upgrade across type boundaries (other than fighter/fighter bombers and dive bombers/tactical bombers)? Status: offline Always happy to help! Actually that is the point I am trying to test. So far in my experience I have never actually seen that happen. But the manual, at least on one reading, says it can even when you cannot do it manually. However even if it can it would be rare - and even less likely to do so if you have a healthy pool of the right types of aeroplanes.